President Donald Trump&apos;s ex-lawyer has given substantial help on how Russian nationals tried to affect the 2016 election, a legal memo has revealed. Michael Cohen&apos;s help is detailed in the memo from Robert Mueller, who is heading the probe into alleged Russian collusion with the Trump team. The memo is mainly to guide sentencing for crimes Cohen has admitted. A second Mueller memo sets out the case against ex-campaign chief Paul Manafort for breaching a plea bargain deal. Cohen and Manafort are among a number of Trump aides being investigated in Special Counsel Mueller&apos;s probe. Both have been co-operating with his team but Mr Mueller now accuses Manafort of lying. In a separate court filing on Friday, prosecutors in New York made their case for the length of Cohen&apos;s sentence when it is delivered on Wednesday. They say he should serve a "substantial" jail term after admitting violating campaign finance laws, committing tax evasion and lying to Congress. President Trump has repeatedly denied there was any collusion with Russian officials, calling the investigation a "witch hunt". The White House said Friday&apos;s memos offered nothing new or damaging about the president. Mr Trump tweeted: "Totally clears the President. Thank you!" although it was unclear to what he was referring. What was in the Mueller memo on Cohen? It is a government sentencing memorandum on the one charge of lying to Congress. Cohen had admitted making false statements about a Trump property deal, out of loyalty to the president. Image caption The memo from Robert Mueller&apos;s office says there were "sustained efforts by the Russian government to interfere with the US presidential election"
The memo says that although this crime was serious, any sentencing should be served concurrently with the New York prosecutors&apos; recommendations on other crimes. The memo says Cohen has taken "significant steps to mitigate his criminal conduct". "Provided information about his own contacts with Russian interests during the campaign and discussions with others in the course of making those contacts"
"Also provided information about attempts by other Russian nationals to reach the campaign"
What was in the New York prosecutors&apos; memo? 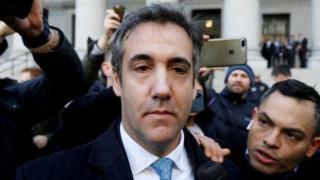 The New York prosecutors&apos; submission said Cohen had committed four federal crimes over several years. "He was motivated to do so by personal greed, and repeatedly used his power and influence for deceptive ends," the filing said. One of the crimes Cohen admitted was paying hush money to two women who alleged they had affairs with Mr Trump. This could amount to a violation of US campaign finance laws. While the prosecutors accepted Cohen&apos;s help with the Mueller investigation should be taken into account in sentencing, they said it should only bring a "modest" reduction on the guidelines of four to five years. What do the Cohen memos all mean? In a one-two punch of court filings, the memos say that Cohen should get credit for providing useful information to investigators. But not too much credit. Some of the information in the special counsel&apos;s document is already known. The negotiations for a Trump Tower in Moscow, which lasted well into the 2016 presidential campaign, were once again outlined. But the document drives home the point that Donald Trump was kept informed about the possible deal, which could have netted "hundreds of millions of dollars" and that the negotiations took place "at a time of sustained efforts by the Russian government to interfere with the US election". Other details Cohen supplied are largely left to the imagination. The president is also once again implicated in the campaign finance charges against Cohen. The New York prosecutors state that Mr Trump&apos;s lawyer acted to silence two women who claim they had affairs with Mr Trump in order to "influence the 2016 presidential election". What&apos;s more, Cohen "acted in co-ordination with and at the direction of Individual 1". What all this means is that prosecutors in New York and Washington are claiming the president had implicit knowledge and involvement in a campaign finance crime. He also had knowledge of a massive property deal that involved contacts with Russian government officials while he was running for president in an election that was being targeted for influence by the Russian government. The picture they paint is a dark one. Paul Manafort served for five months with the Trump campaign team, three of them as campaign manager, before being sacked. This latest memo, from Mr Mueller&apos;s office, tries to spell out how the special counsel believes Manafort breached a plea bargain deal by lying to investigators. Manafort was convicted of financial fraud in August relating to his work as a political consultant in Ukraine. He then accepted a plea bargain deal under which he would help with the Russia inquiry. The deal had meant Manafort would face up to 10 years in prison, with certain charges dismissed. His lawyers deny he has lied. The memo calls these "multiple discernible lies - these were not instances of mere memory lapse". Our correspondent, Anthony Zurcher, says that given the central focus of Mr Mueller&apos;s investigation is Russia-Trump links, the Kilimnik connection could prove to be of particular interest. Published on Fri, 07 Dec 2018 23:26:15 GMT, © All rights reserved by the publisher.